We were glad to spend some time with our families and friends who took great care of us. We were very excited to see that our journey is inspiring them and we are really happy to share about it. We crossed Gibraltar strait last week and we are proud of it! It might be something casual for some but sailing in the Atlantic ocean is something new for us. We are loving the constant wind speed, being in the big ocean is giving us a bigger sense of freedom. We loved Cartagena with all its small museums and people from Cartagena have proved many times to be really friendly. We spent more time in the marina than we initially anticipated but it has been a great opportunity for us to explore a city rich in culture. We spent a very nice time in the Balearic Islands, sailing in Majorca was a pleasure, we saw lots of beautiful sailing boats, winds were just perfect during the day. The island is beautiful and clean and people are very nice. We also had family and friends on board that were delighted with the behaviour of the crew! Positive discipline is working for us! On top of all of this, what a great pleasure it is to be back home, in Spain. 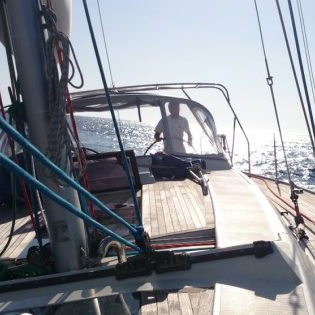 We crossed from Malta to Mallorca, in a 5 days/5 nights passage. We wanted to test us and to test the boat. Read on to learn how it went! "Is your trip as wonderful as you were expecting?" is the most frequently asked question from our friends. I always answer the same: we have some days easier than others. Travelling and living on the boat is not the same than being on vacation on the boat. This year after spending 3 months sailing around the Med, surrounded by nature, I am more concerned than ever about this day and what it means. From now more we are committed to #movethedate. In Trapani (Sicily), we met with some friends and we spent 3 wonderful days discussing about our planet, minimalism and kids education (all those neo-hippy stuff :-)… and we agreed that humans are a virus attacking the planet. We have to take care of this problem, for us and for the future generations. We literally felt in love with Pompeii archaeological site an its history. What an experience to be transported more than 2000 years back in time, see how (wealthy) Romans were living and how we are still building cities with the same structure than Greeks (yes, Pompeii was founded by Greeks) did more than 28 centuries ago. So similar to what we do know in many ways… but also so distant: the most striking aspect of pompeii (and the roman way of life) is slavery. We have to keep fighting to completely abolish slavery in our world. The last weeks confirmed that 'not having a fixed plan' is the way to go. We are constantly adapting our journey to the changing conditions and we think it's the right approach. The crew's spirit is (usually) high, frustrations are low. The wind pushed us from Corsica to Sardinia, Ustica, Palermo and the Aeolian islands. New speed records, new experiences, volcanos... Epic !